One of the great things about having access to a Kindle Unlimited subscription is that I’m able to access a huge number of titles that I wouldn’t otherwise be able to afford if I had to purchase them individually. As such, I’m currently having a great time in downloading and reading a huge number of eBooks, including a lot of anthologies and other short story collections. I’ve always enjoyed reading anthologies because of the richness and variety in writing styles, themes and voices that can be found within them, and I particularly enjoy any anthology that covers that huge genre known as the Cthulhu (or Lovecraft) Mythos. Any stories set in the Mythos are always a huge favourite of mine to read, only taking second place to anything set in the alternate history genre, and fortunately there are a great number of Mythos anthologies available on Kindle Unlimited. 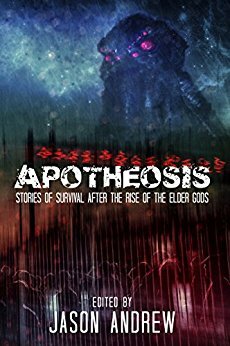 One of the first that I downloaded, and indeed one of my most eagerly-sought anthologies on my KU reading list, was Apotheosis: Stories of Human Survival After The Rise of The Elder Gods, published by Simian Publishing in late 2015. The anthology was funded by a Kickstarter, which I narrowly missed backing and have regretted ever since, because the concept for it sounded amazing: while there are many and varied Mythos stories about the oncoming apocalypse that will be caused by the rise/return/rebirth/end of naptime of various Old Ones, or about the actual apocalypse taking place, to my knowledge there are relatively few tales that deal with how humanity actually deals with the aftermath, and even fewer that have been collected in anthologies focused on that specific theme. It’s potentially a difficult topic to write a story about, because there will inevitably be a balancing act between portraying the grim and depressing realities of the outcome of such an event, but also writing a story that isn’t so misery-inducing that potential readers will abandon it after only a few pages. However, I was eager to see if Simian Publishing and the stories it had chosen were up to the challenge, so I dived straight in. Apotheosis begins with a brief but interesting foreword by the editor, Jason Andrew, which lays out his thoughts behind the themes of the anthology, including the intriguing question of how ‘human’ any survivors would be after the mind-shattering chaos of an incursion by an Elder God. This is then followed by seventeen short stories; again, as with all of my anthology reviews, rather than listing all of them, I’ll instead highlight those stories that I felt really stood out. The first story, The Smiling People by Andrew Peregrine, is an excellent start to the anthology; set in the ruins of a city, its survivors try and go about their pre-apocalypse work roles, including the protagonist in his office block. Unfortunately, there are certain issues – there is a gigantic wall of wreckage blocking any attempt to leave, and the city is full of the Smiling People – humanoids with faces that are blank except for terrifyingly huge mouths full of razor-sharp teeth. The Smiling People follow the survivors everywhere, and there is no escaping them, even in the most private of moments. It’s a deeply unsettling story, particularly by the end when the exact reason for the Smiling People’s presence is revealed, and is easily my favourite tale of the entire anthology. Dilution Solution is a fast-paced read, with author Adrian Simmons looking at the toll fighting the Elder Gods and their servants would take on what was left of humanity’s military, and Earth Worms by Cody Goodfellow is an interesting take on the theme of the entire anthology; the apocalypse has come and gone, with a small band of survivors under a cult leader waiting to see what happens when the cause of the apocalypse arrives. But when they do, one survivor finds that surviving may have been worse than dying, particularly when he finds out what is in store for those who lived. Another great tale is Eliza by Joshua Reynolds; Mr Reynolds is one of my favourite authors, both for his work in the Warhammer and Warhammer 40,000 universes, but also for his original I.P., The Royal Occultist, a series of novels, novellas and short stories that I intend to review in detail in the near future. But in this anthology, he effortlessly weaves a tale of a cyberpunk future in humanity’s last remaining city, and the dehumanising efforts taken by that city’s eternal leader to turn some of its inhabitants into living bioweapons to defend against the Elder Gods and their servants that have destroyed the rest of the planet. Many of the tales in Apotheosis are dark and grim, but To The Letter by Jeffrey Fowler is by far the darkest and the most depressing, with an ending that still makes me uncomfortable almost a week after reading it; to try and describe it would only spoil its plot, but suffice to say that, despite the subject matter, it is incredibly well-written and plotted, with excellent characterisation. I also enjoyed Of The Fittest by Evan Dicken, whose protagonist tries to adjust to ‘civilian’ life after years of fighting for the forces of the King in Yellow against cultists who serve the other Elder Gods who have occupied the planet; and Overcome by Jason Vanhee, which is a short but touching story that looks at how faith could be maintained even in the face of the Elder Gods and the ruination of humanity, and the cost of keeping that faith no matter what happens. And the anthology closes out with Venice Burning by A.C.Wise, a story that was only just beaten by The Smiling People as my favourite – it’s a complex, fast-paced but rewarding story of time-travel, personal responsibility and just how strong a person’s will can be in the face of the apocalypse, and one that bears fruit from being read several times. Apotheosis: Stories of Human Survival After The Rise of The Elder Gods, then, is a fantastic anthology, full to the brim with a collection of high-quality stories centered around a very well thought out central theme, and it includes several stories that I personally think need to be in the collection of any self-respecting reader of the wider Lovecraft/Cthulhu Mythos.